Wrestling runs in the family and usually it is the parent patting their athlete on the back. 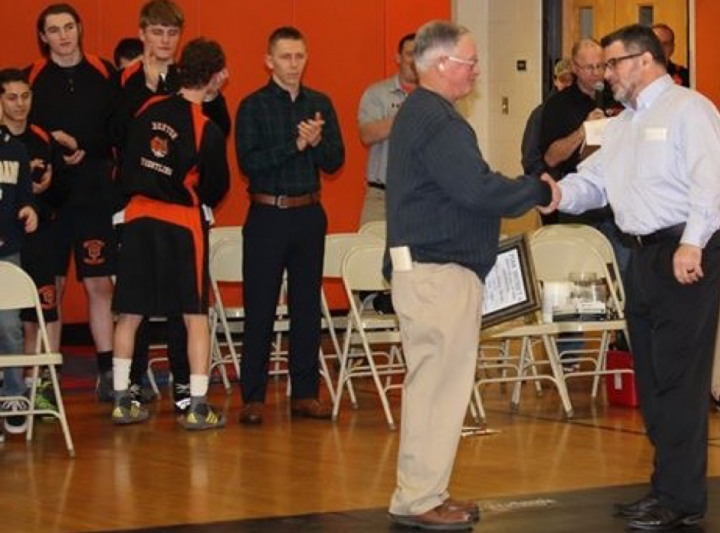 This was not the case as Russell Hughes, Bloomsburg University’s assistant wrestling coach, traveled to his hometown of Benton, Pa. to congratulate his father on a recent accolade. “He is and always will be the mold of what it means to be a coach and a consummate professional,“ Hughes added. “Coach Hughes’ long-standing character hits home off-the mat, thanks to his disciplined mother, “Pinky,” who is healthy and 102 years of age. Married happily to “Tucker” Hughes for 55 years, Scott is the proud father of 5 children, who all graduated from Benton Area Middle-Senior High School, and 12 grandchildren. Tom is a retired U.S. Air Force Chief Master Sergeant and is currently employed at the Pennsylvania Emergency Management Agency; Kelley is a retired U.S. Marine Master Sergeant and currently a senior at Bloomsburg University; Christine is a successful business owner and 1990 graduate of Bloomsburg University; and wrestling champions, twins John and Russ, currently coach Division I wrestling at Lehigh University and Bloomsburg University of Pennsylvania, respectively. On the mat, Coach Hughes has amassed more than 37 years of coaching and support for District IV and Benton wrestling. His proven dedication and coaching of male and female wrestlers at the junior high and senior high school levels have produced the following: 12 Division I, II, III College All-Americans; 57 PIAA “AA” State Placers; 17 PA State Champions; 13 PA State runner-ups; 44 Northeast Regional Champions; 98 PA State Qualifiers; 49 District IV Champions; 101 District IV Top (5) placers who became Regional Qualifiers; 98 EC Sectional Champions; 25 wrestlers with more than 100 career wins; 10 Benton High School teams finishing in top 10 PIAA Individual Team Score Championships; and has coached 6 individual wrestlers who competed in the Dapper Dan Classics; 2 PAN-AM World champions who were wrestlers of the Benton Tiger Wrestling Club; 1 World Cadet champion and another World Cadet second place finisher. At the age of 75, in addition to coaching, he continues to volunteer three days a week, 6:30 a.m., at Benton’s weight-lifting sessions-a program he initiated in 1981. Author’s Note: Russ Hughes was hired in November, 2016, to serve as the assistant wrestling coach at Bloomsburg University. He came to Bloomsburg after serving as the head coach of Benton High School wrestling since 2007, compiling a record of 118-62. Hughes, a 1998 graduate of Penn State, guided Benton High School to the 2010 PIAA “AA” Team State Championship, while finishing as runners-up in 2009 and 2013. He also guided Benton to four PIAA District 4 “AA” titles and five PIAA “AA” Northeast Regional crowns. He was named the 2010 PIAA “AA” Wrestling Coach of the Year and was inducted into the Pennsylvania Coaches Hall of Fame in 2003. As a wrestler for the Nittany Lions, he was a 1996 NCAA Division I All-American finishing third that year. He was also a 1995 USA University Freestyle Champion; captured the USA Fila Junior World Freestyle title in 1992 and was a 1991 USA Junior Greco-Roman Champion.